A sign is displayed in the parking lot of a Lowe's home improvement store May 18, 2009 in South San Francisco. A popular home improvement store will pay $18.1 million to settle a lawsuit accusing the chain of environmental violations. Lowe’s Home Centers throughout the state of California were accused of illegally disposing of hazardous waste for more than six years. Among the accusations – that the store collected recyclable materials from customers through kiosks in the store but then dumped the items into the trash. The suit, filed in Alameda County, claimed employees tossed out materials such as pesticides, aerosols, paint and colorants solvents, adhesives, batteries, mercury-containing fluorescent bulbs, electronic waste and other toxic, ignitable and corrosive materials. Of the eight stores in San Diego County, officials said all were unlawfully disposing hazardous waste. Prosecutors say Alameda County Superior Court Judge George C. Hernandez approved the settlement Tuesday. 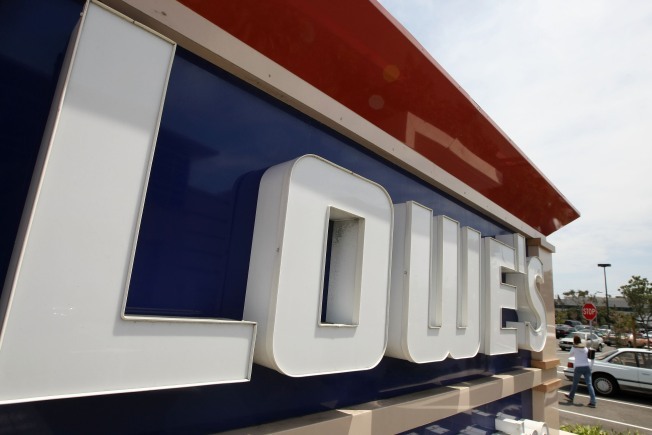 The settlement payment by Lowe’s, based in North Carolina, will be shared by 32 prosecutors from across the state and will help fund environmental enforcement and cleanup projects. As a result of the investigation, the company has adjusted its store policies and procedures, according to the San Diego County District Attorney’s Office. Hazardous waste will be collected and properly disposed of and accounted for, officials said.